This backcountry cabin is a local legend. Set at the base of Allenby Pass, weary riders have been resting their heads at Halfway Lodge since the 1920s. It’s been the setting for countless tales of wilderness adventures and one unbelievable story about a bear that literally dropped in for visit. 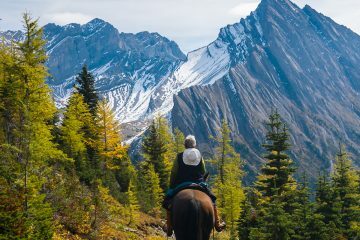 It all started with iconic mountain guide Erling Strom, who used the cabin as a stopover for his guests while travelling from Banff to Mount Assiniboine. Strom’s wranglers slept outside in tents while the guests curled up by the fire inside the lodge. Over the past 80 years, the experience at this rustic cabin hasn’t changed all that much. Things are kept simple: propane lanterns and candles provide the lighting while a woodstove provides the heat and keeps the coffee warm. But Halfway Lodge did undergo one big change in 1967 when they added a second storey – for an extraordinary reason. A bear had managed to claw its way up to the roof of the cabin and then somehow worked its way inside the building. That invasion prompted the owners at the time to build an additional storey, raising the roof far out of the reach of any type of backcountry critter. 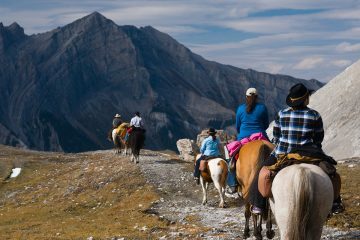 Set 32 kilometres from the Banff townsite, Halfway Lodge normally takes two days of riding to get there.